Occurring in polar and subpolar climates, palsas are low ovular frost heaves containing ice lenses which are permanently frozen. A group of well developed palsas as seen from above. Ice lenses are responsible for palsa growth. A palsa is an oval-shaped, low-lying mound of frozen earth. This geographic feature is sometimes referred to as a frost heave, or a bulge in the earth’s surface which is created by increasing amounts of underground ice. As the ice expands, it pushes the earth’s surface upward, creating a palsa. Palsas can be found in polar and subpolar regions, where permanent ice lenses exist. Ice lenses occur when ice accumulates in pre-existing cracks in either rocks or the ground. As the ice expands in these cracks, it pushes the soil or rock further apart. Palsas are usually small in size and occur in groups. Often, they are located near a source of groundwater, like bogs. This is particularly true of bogs in areas with discontinuous permafrost, which means that the permafrost does not cover a solid area, but rather occurs in patches. Palsas are typically recognized by their mound-like shape, although they may also occur in ridge-like formations, either straight or curving. Other palsa shapes include: plateaus, dike-shaped, ring-shaped, and conical. Palsas may range anywhere between 49 and 492 feet in length and between 32 and 98 feet in width. Some extreme measurements of 1,640 feet have also been recorded. Most of the larger palsa formations are the result of several palsas located close together, forming large complexes. Additionally, palsas may reach heights as high as 32 feet or as low as 3.2 feet. The ice lens which surrounds its surface is usually around 1 inch thick, although some records indicate ice lenses of around 15 inches thick. As previously mentioned, many palsas form in bogs and moors. During oncoming winter fronts in these areas, the ground reaches freezing temperatures faster than the surrounding air. Researchers believe this happens because the ground is already covered with a thin layer of snow. A thick layer of snow, in contrast, would actually work to insulate the ground underneath and keep it warmer. The underground ice, which pushes up the soil to create the palsa, may be able to last throughout the summer season. The palsa continues to form and change because its underground temperature consistently remains colder than the surrounding area. An ice lens is able to form under these conditions by pulling in nearby water. This water freezes upon reaching the palsa and further pushes the surrounding ground in all directions. This forceful pressure pushes additional groundwater up to the surface. Once on the surface, the water works its way into the cracks and continues to contribute to the growth of the ice lens. 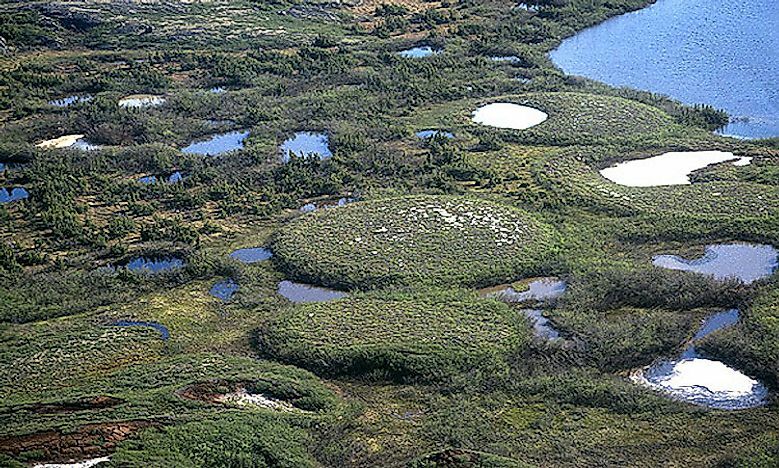 Palsas are most commonly located in areas with discontinuous permafrost. These areas occur in subarctic regions, including: northern Canada, Iceland, Alaska, Siberia, and northern Fennoscandia. Outside of these regions, palsas may occur in areas with particularly long winter seasons, thin snow cover, and an excess of bog wetlands. Although currently found in the northern hemisphere, researchers have identified collapsed palsas in the southern hemisphere. Most of these palsas are located on the Isla Grande de Tierra del Fuego, on the Argentinian side. These formations have been dated back to the Last Glacial Maximum, which occurred sometime between 24,500 BC and 17,000 BC. Ancient palsas have also been identified in the area between Germany and Belgium, in the Hochmoor.